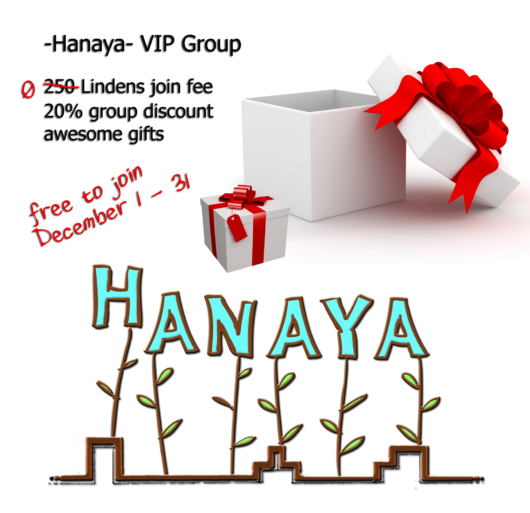 Due to ongoing grid-wide issues with in-world group joining, the -Hanaya- VIP group free-to-join time has been extended ’til the end of December. 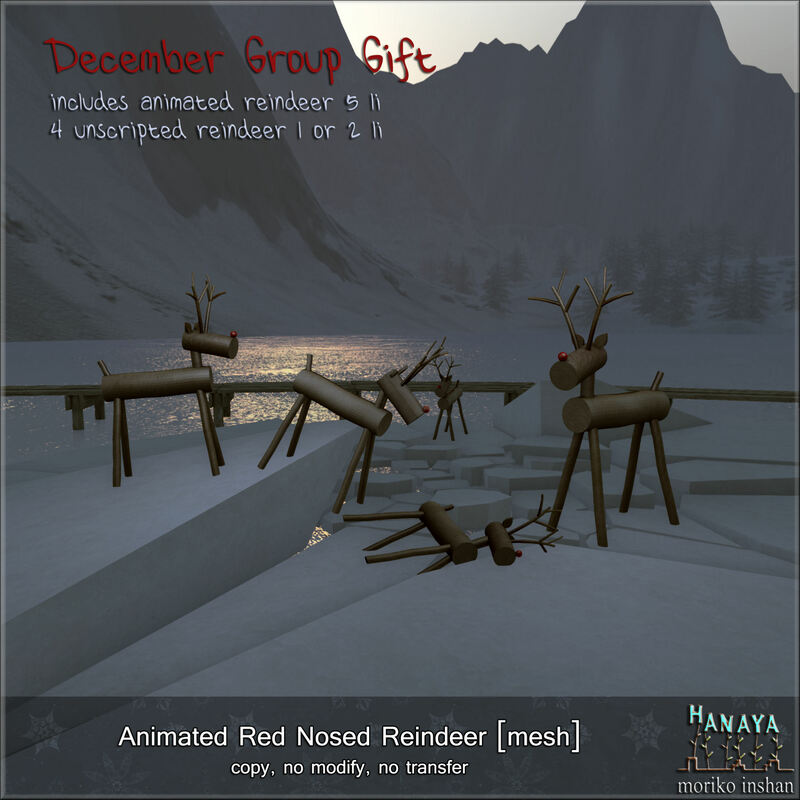 The Animated Red Nosed Reindeer group gift has been sent out on the -Hanaya- VIP group, so you can get it from group notices. Or better yet, stop by -Hanaya- in-world and get your copy and see all our new Christmas and wintery releases. 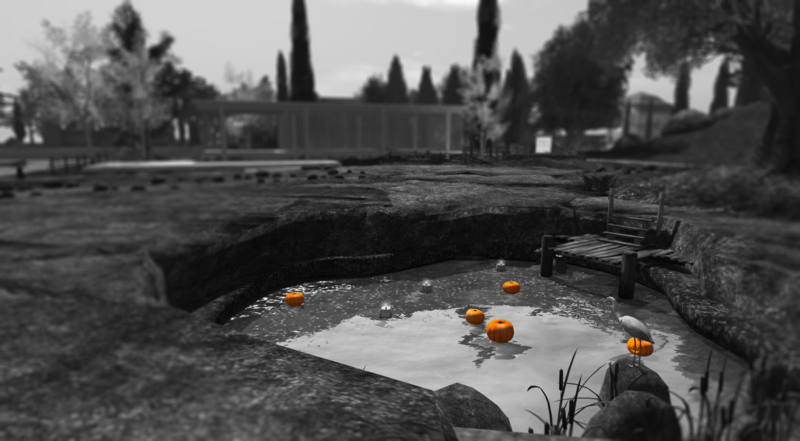 This entry was posted in Freebies and Gifts, News on December 12, 2015 by moriko. The set includes four shape styles, and each style is provided in foliage only, with lights and with lights and bows. The lit versions can be turned on and off with a click. Use them alone or in pairs to frame a fireplace or front entrance. Or group them for extra impact. Land impact varies from 5 – 9 PE. Ball topiary is a style of grafting and pruning that was made popular in formal Victorian gardens. Made from boxwood, the leaves are a deep green colour and contrast well with the antique crackled finish of the octagon-shaped planters. This entry was posted in Events, News, Product Announcements and tagged ACS, American Cancer Society, Relay for Life on December 1, 2015 by moriko. Please note that the -Hanaya- group for VIPs is changing. After 5 years with the old name – it’s time. The new group is free to join November 23 – 30, 2015. Click here to open the group profile -Hanaya- VIP Group. The gift has been sent out on the new group, so grab it from the notices or visit us in-world. This entry was posted in Freebies and Gifts, News and tagged free, gift, VIP Group on November 23, 2015 by moriko. Today, we would like to feature the brand new -Hanaya- Wicker Garden Dining Set. 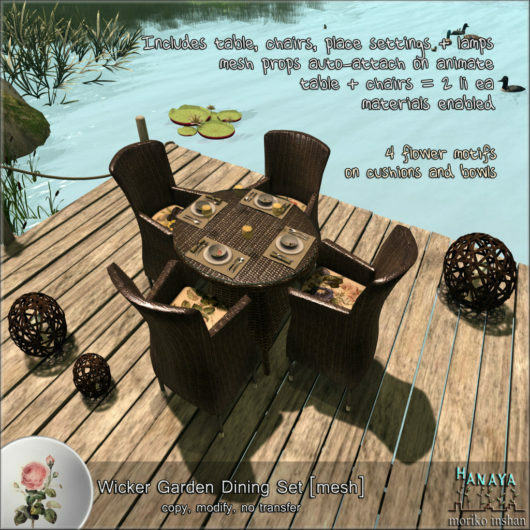 Super low land impact with materials – the table and chairs are only 2 li each. 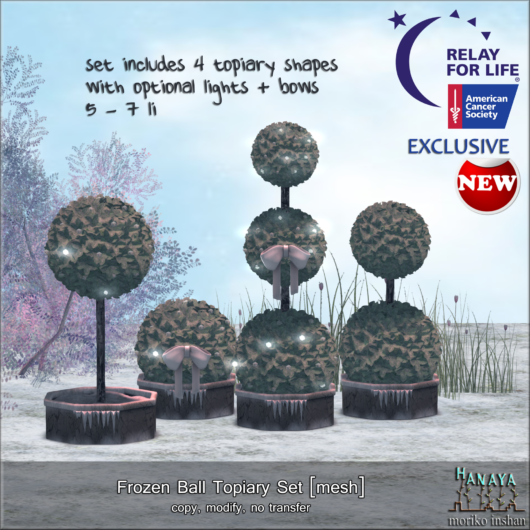 The set is on display at -Hanaya- in-world store and can also be purchased on the Second Life Marketplace. The set consists of a glass topped wicker table, 4 different types of chairs and place settings, wicker ball lamps in 3 sizes and 2 optional patio bases. All items are copy so rez whatever you need. The chairs have menu-driven poses divided into Girls and Guys. There are a total of 8 animations in each chair. The chairs rez wearable mesh props, which attach to your avatar on permission. Access security can be set in the chair menu. The place settings can also be clicked to get a folder with the props. The wicker ball lamps, which are provided in 3 sizes, include a scripted candle. To turn the candles on/off, zoom in and click the top of the candle wick. Also new are the -Hanaya- Wildflower Stepping Stones and -Hanaya- Wildflower Plaques. Both are available on the Second Life Marketplace, and the stepping stones are also the current group gift for our VIP group. The gift has been sent out on the group (check notices), and is also available in the customer service area of our in-world store. Please activate your group tag and simply click the group gift vendor. If you guys are part of one of our groups, you will have read earlier this month that we made some changes to our in-world store. For the last 5 years, we owned 90% of a full region on mainland – with our store in the sky, and a public parkland and our home at ground level. Having finally got tired of having to screen out unsightly neighbours, we decided to let most of the sim go, and have relocated our home and my store workshop to a sim on a private estate. Yeah, it’s a homestead – I really miss having 14,000+ prims to play with!! Anyway, we kept a smallish parcel at the -Hanaya- store location (the store landmark has not changed), and the store is up and running again. It is smaller of course, so we will only be having the newest products rezzed out, with balance of selected products in wall vendors. This entry was posted in Freebies and Gifts, News, Product Announcements on June 19, 2015 by moriko. As some of you know I was planning to be in this year’s Second Life Home and Garden Expo. And I was really looking forward to it too. Not just because I like making the kind of things that will be on sale there, but also because it benefits a cause that I am passionate about, since I am a cancer survivor. To make it short; I won’t be there. I had bought some full perm mesh farm animals from a store called Just Animals on the Second Life Marketplace and I had used them in a product which was to be part of the Gatcha @ Expo program to benefit Relay for Life. It turns out that it is possible that the original source of these full perm meshes may be a service called Turbosquid, where full perm meshes are sold for dollars. The first I heard of Turbosquid, is when a coalesced object of more than 1300 prims was returned to my Lost and Found folder, immediately followed by being ejected and banned from the Expo sims without notice. I was really upset – who wouldn’t be. But after a sleepless night, I am trying to look on the positive side of this thing. And these are the important points to me arising from the mess. I am glad that the organizers of the Expo are diligent about potential IP theft. I wish more event organizers were as thorough. I will be very cautious if I buy full perm meshes on the Second Life Marketplace or at any in-world store. And last, and most important to me, is that I will buckle down and devote time to learning 3D modelling properly. It’s long overdue. So I will be taking time off from -Hanaya- to go back to 3D modelling school. Building in-world and using mesh exporting tools like I have been doing is just not good enough. The -Hanaya- Subscribe-o-matic group and in-world store groups will be closed at the end of September. I will be scaling down the in-world store in the next few weeks – likely turn it into a little park with only a handfull of my products that I am really proud of. I took this snap of my store at Home Expo 6 before my stuff got returned. 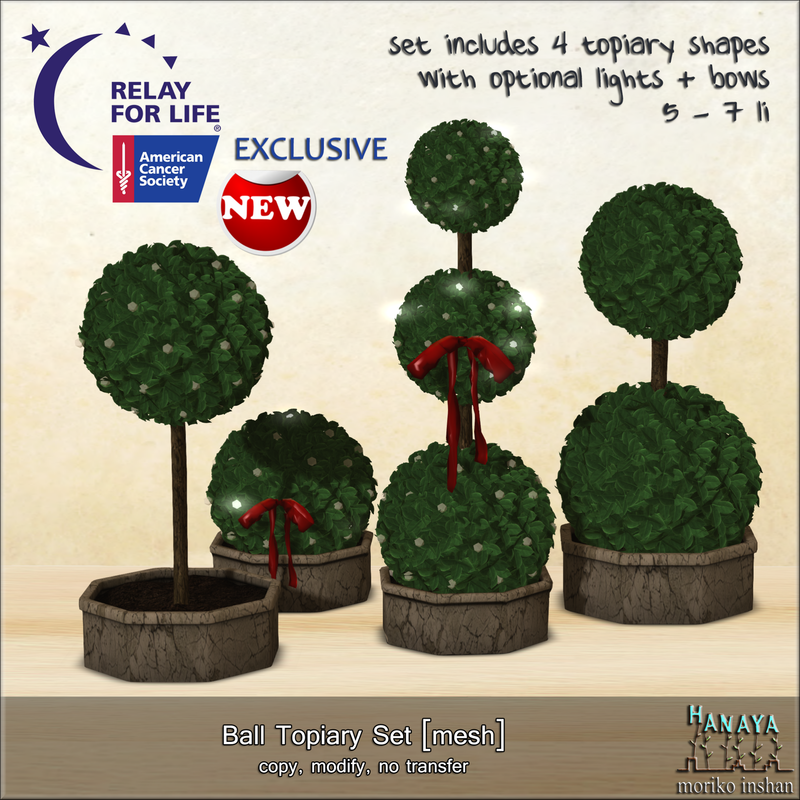 This entry was posted in News, Opinion and tagged Home and Garden Expo, Relay for Life on September 16, 2014 by moriko. -Hanaya- is one of the sponsors of Rhapsody, and we have 3 brand new and exclusive products created especially for the event. All are hand-crafted mesh with materials, and have the option of being purchased as gift at the event. free-standing in your garden, or put up against a wall. It consists of a base, and various pods for vegetation, birds and water. When all pieces are linked to the base, it is 20 LI. All pieces are also provided as stand alone components, and weigh 1 – 3 LI. The piece has randomly generated bird song, as well click to turn on/off. The waterfall section has flowing water and gentle trickling sound. 3 for guys as well as 3 synchronized couple sets. Inspired by the location of Yasgur’s Farm, where the Woodstock festival was held in August of 1969. The piece is an original mesh with materials, and is only 5 LI at provided size. Visitors to the -Hanaya- booth at Rhapsody have a gift waiting for them. 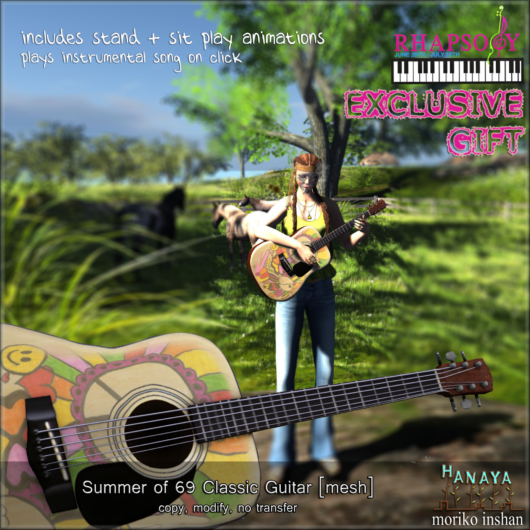 Our Summer of 69 Classic Guitar contains 2 animations to play the guitar (standing and sitting cross-legged), and is provided in 2 sizes. The gift is free – just touch the vendor to receive your copy. If you do happen to pay 1L instead, it is immediately refunded to you. This entry was posted in News, Product Announcements on July 4, 2014 by moriko. Don’t you adore the scent of lilacs? When I smell a lilac in bloom, I am immediately transported to the streets of my childhood, feeling the excitement late spring and the promises of carefree summers. A colourful little bucket holds three sprigs of lilac blossom, and comes in 4 colours. The gift has been sent out on the -Hanaya- Yummy Collectibles in-world group, and will also remain available in the Customer Service area of our store during the month of May. Not a member of the group? 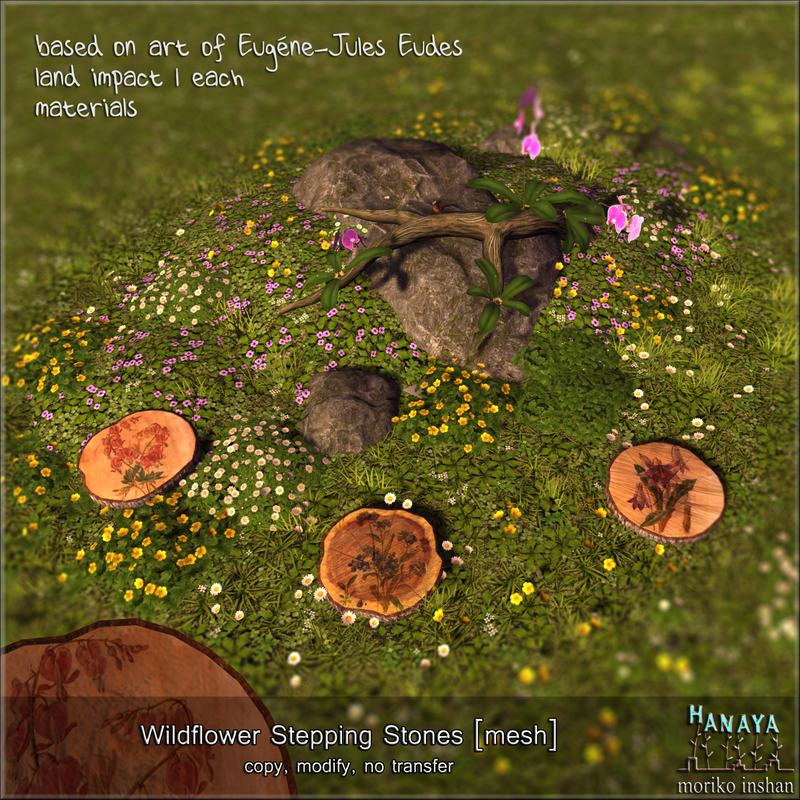 -Hanaya- Spring is Here will be available for sale starting in June 2014 both in-world as well as on the Second Life Marketplace. This entry was posted in Freebies and Gifts, News on May 1, 2014 by moriko. 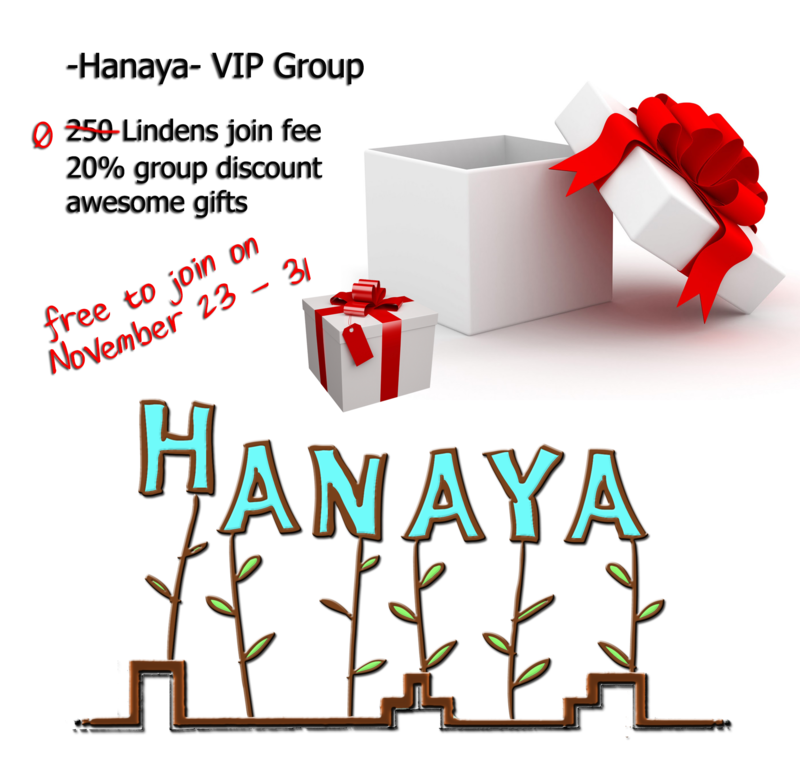 Guys, the -Hanaya- in-world VIP group is free to join today. 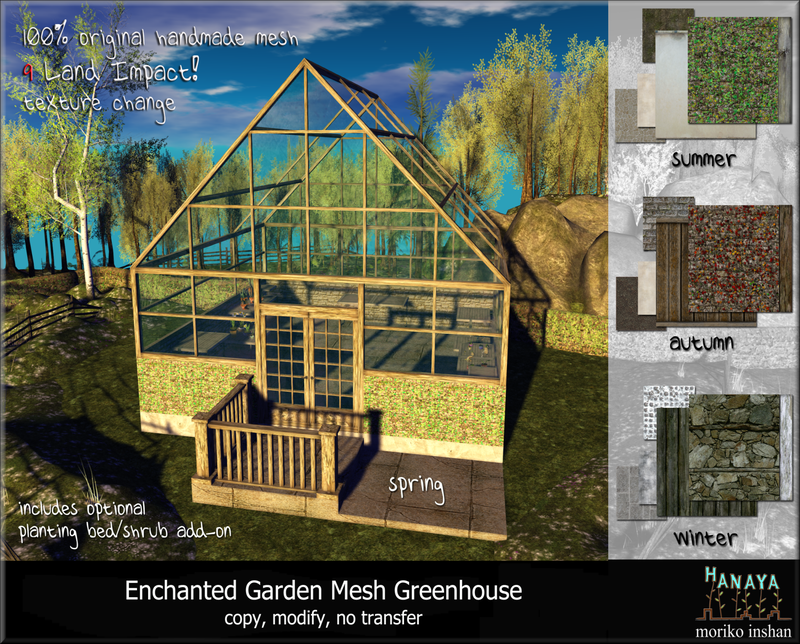 Monthly awesomesauce group gifts, group discount on all inworld purchases (except gatchas), and the obligatory product announcements. come and visit us in-world. This entry was posted in News on April 6, 2014 by moriko. I guess you guys know I am majorly into gardening in real life, and that I am a transplanted Canadian who now lives in the mild climate of southern Germany. Having it actually be warm enough to plant out annual flower seedlings outside at the beginning of April is something that I still treasure, despite living here for almost 6 years. Especially when I can gloat about the weather to my Canadian friends and family. Anyway … I have three new flower products out today. And all are gifts. First up is the April group gift for my sweet customers in the VIP group. 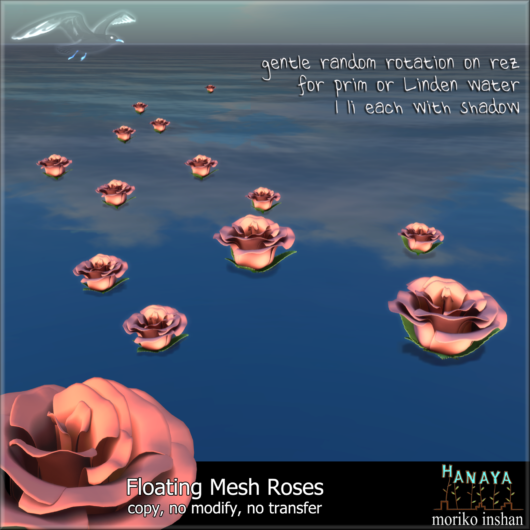 A bowl of gently rippling water holds 3 perfect floating roses, and scattered rose petals. The package contains 3 versions – with more or less petals. A mesh product with sculpted petals – brand new for April 2014. The gift was sent out on the group today, and will remain available at -Hanaya- in-world store for the month of April. These precious little mesh roses are the our hunt gift for the Evil Bunny Hunt. They contain a script that makes them gently rotate at random speeds and direction. Use them either on Linden Water or prim water. And since they are only 1 LI, put out a bunch of them – that creates the best effect! -Hanaya- is also one of the sponsors of the Evil Bunny Hunt, which means that if you finish the hunt and get to the very end, you will find lots of golden eggs hidden in a forest to reward you. And one of them is our French Country Mixed Bouquet – a brand new release especially for this event. 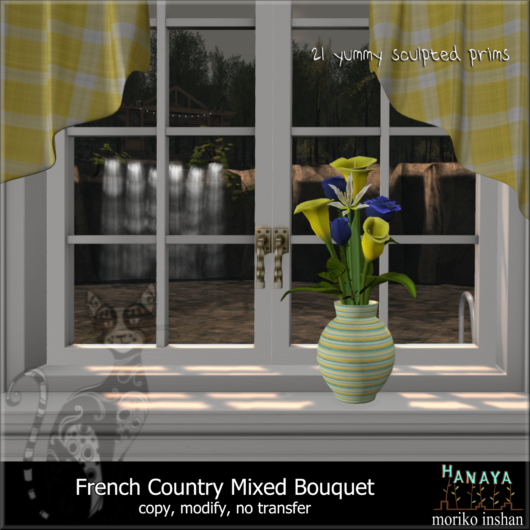 This entry was posted in Freebies and Gifts, News on April 1, 2014 by moriko. 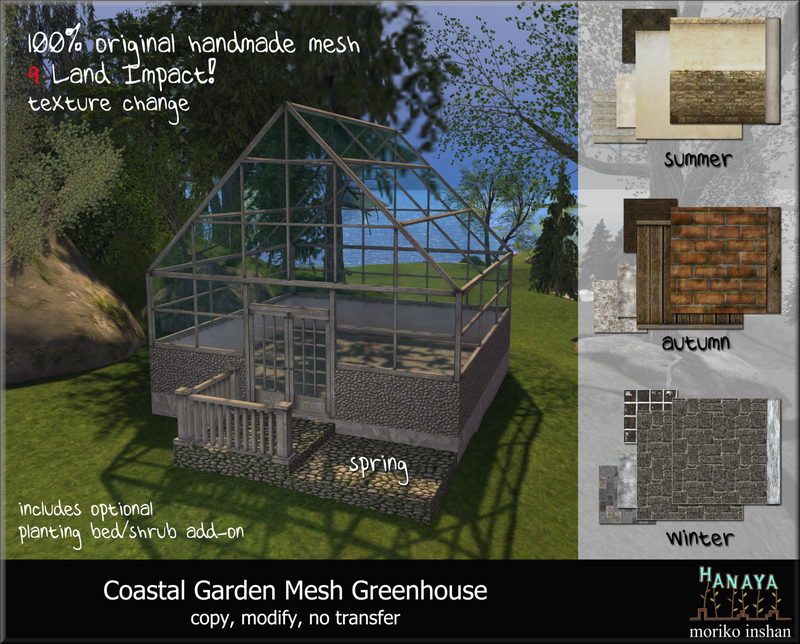 To welcome spring, we are excited to bring you two more low prim mesh greenhouses that weigh in at only 9 LI. And the best part is, that you can change the colour themes for all 4 seasons at a touch. Both greenhouses feature crisp textures, doors with optional security and greeting message, as well as planting bed/shrub add-ons for each season. The Enchanted Garden model features ivy covered and rough stone walls with matching wood framing. Place your home and garden treasures on the optional greenhouse shelving (see below) and surround yourself with your treasures. Whether your home is by the seaside or just love the idea of having a coastal retreat in your own backyard, the Coastal Garden model of our greenhouse features exterior finishes that are able to withstand strong sun and salty winds. Our original mesh greenhouse shelving can fit any structure. In the image above, it is demonstrated on a 10 x 10 meter base. Provided in 3 separate pieces for optimal placement ease. During the month of March, this product is the group gift for members of our VIP group. All models of our mesh greenhouses are on display at our new in-world display area, which is located directly below the store. All of our greenhouses are available for purchase at our in-world store, as well as on the Second Life Marketplace and on PrimBay. This entry was posted in Freebies and Gifts, News, Product Announcements on March 5, 2014 by moriko.